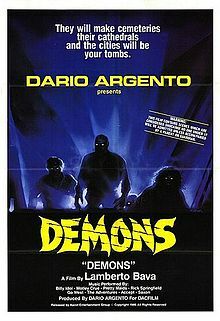 When I asked friends for movie recommendations this year, the wonderful, marvelous, lovely Laura posted, "Demons is the one that scarred me for life in 1986, and is the reason I cry whenever I see zombies of any kind!" My buddy Steve concurred: "Demons is great!" Good enough for me. Tonight is Demons! If I had to create a primer on 80s horror for somebody, this would almost definitely be one of the movies to be included. The music, the atmosphere, the sleaze... Even if you haven't seen this movie before, you'll feel like you have when you turn it on, and I mean that in a good way. It just feels familiar. The story starts with Cheryl, an attractive woman who believes she is being pursued through the subway by a man in a mysterious demonic-looking mask. He finally approaches her, and it turns out that he is passing out tickets to a free show at a newly renovated movie theater. She takes a friend to the movie with her, and they sit with two men who had been flirting with them. The movie begins, and it's a very violent horror movie featuring a mask which was on display in the theater lobby. In the movie, a character scratches his face with the mask and begins to transform into a zombie-demon thing. In the theater, the same thing begins to happen to a woman who accidentally nicked her own face on the mask in the lobby while she was playing with it. You've seen zombie movies, you know what happens next. She takes a bite of somebody, who takes a bite of somebody else, etc. This was a fun movie. Surely there's been another horror film set in a movie theater at some point, but I can't think of one right away. It's really a great setting, though. It's enclosed, it's dark, there's a cross section of different people in the audience. It makes for a good horror setup. There's also some very cringe-inducing stuff. I was beginning to worry when I was able to watch two cannibal movies without getting too grossed out, but I guess all it took was some close-up dental and fingernail trauma to get my adrenaline going. I give Demons five film reels out of five.